Event marketing which is also known for its other name event creation refers to the development and designing of themed activities, displays, exhibits and occasions with an aim of promoting a product, service cause or organization. It also refers to the act of using either the traditional forms of media or the new ones to promote, advertise or market a specific event. Different types of event marketing and advertising techniques are often used by experts in this field when it comes to encouraging individuals to participate in the event that they have developed. Among the most common types of events that an event marketing expert can create are festivals, seminars, fundraisers, conventions, sporting events, air shows and workshops. The event marketing process also encompasses business or charitable functions and corporate hospitality activities. The majority of those who wish to host an event gets the services of a reliable event marketing certification holder not only for the purpose of marketing the event but also in properly planning and managing it. A lot of experts also define event marketing as the process of using an event to connect with potential customers, market specific products and services and build brand awareness. Among the events used in exposing a business are trade shows. If you own a business and you plan to join trade shows to start marketing your products, then be aware that the procedures involved in trade show marketing include buying a booth space and presenting your products and services to all the participants of the event. 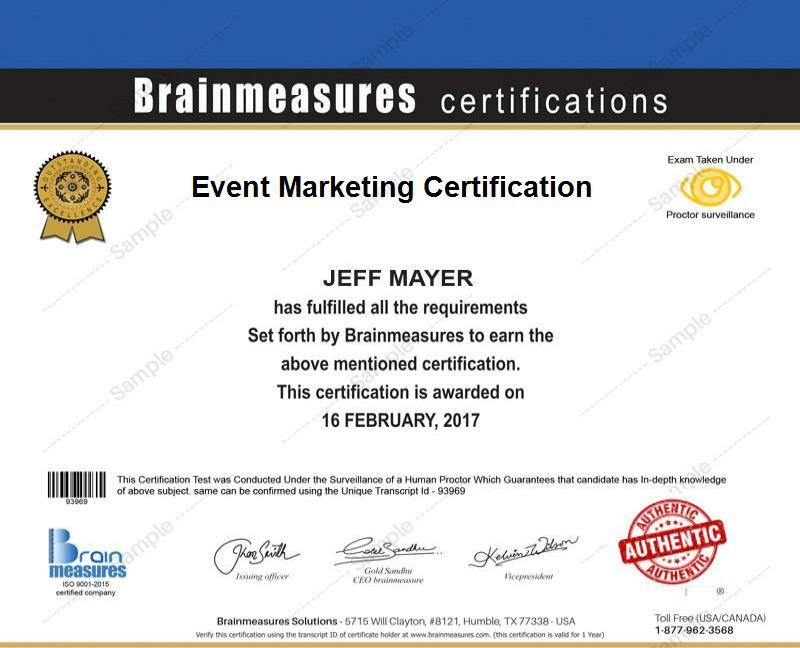 If you plan on becoming an event marketing certification holder, then you should know that an online certification company named Brainmeasures offers a reliable event marketing certification course designed to improve your knowledge about the process of planning and creating events and hone your skills in marketing. By enrolling in this certification course provided by Brainmeasures, you get the opportunity to receive a highly specialized event marketing training which covers all areas about the field. This course will introduce to you the different tactics used in event marketing including the use of social networking sites and employing GPS and a real-time and more synchronized event tracking. In order for Braimeasures to determine if your skills and knowledge are already enough to handle all your event marketing tasks and responsibilities, an online marketing test which is part of the program should be taken. You have to get a passing rate after taking the exam in order for you to grab a copy of your skill certificate. The event marketing certification program from Brainmeasures is extremely beneficial for those who aim to acquire or sharpen their knowledge and skills in the field of events marketing. The certification course is more suitable for aspiring event marketing experts, event organizers, event planners, project managers, event marketing coordinators and marketing managers. The program will definitely introduce you to the procedures involved in using different kinds of events as promotional tools. If you are already an event marketing certification holder, then you can expect to notice a dramatic change in your annual salary. This means that you will be hired in a position which allows you to earn a substantial amount annually. Most event marketing experts at present earn around $37,000 to $147,000 per year.